The answer to this question takes more than a few minutes and it varies, depending on the complexity of the product and the learning culture of the organization. But ramping new hires quickly in a SaaS business is key to accelerating business growth. Part 1 of this two-part blog post examines the causes of the slow sales ramp and explores ways to reduce it. The cost of hiring a salesperson varies depending on the benefit package, hiring fees and onboarding costs, but it is generally accepted to be between 200-300 percent of the first year base salary. A new-hire sales rep, who starts fast and ramps to full productivity in six months, will generate a profit for the company in their first year…and you can hire as many as you can find. This also means you can hire more reps in the first year…critical for a new SaaS business. Hiring a slow starter, i.e. it takes 12 moths to reach full productivity, instead of six, means you are carrying the full cost of onboarding in the first year. This will hamper your ability to grow, unless you are early-stage, your venture backer has deep pockets and growth is not constrained by cash-flow. But where to find fast starter salespeople who are suited to selling your products, or how can you grow them and quickly ramp them? Before answering these questions, we need to examine the causes of a slow start. Dave Kurlan’s formula for ramp up time = The length of your sales cycle + The length of your learning curve + 30 days. For example: If you have a six month sales cycle and a three month learning curve, you have a 10 month ramp up period. Long sales ramp times are a serious problem if it takes 12 months to get a new hire up to speed, when it should only take six months. This is a familiar and thorny problem in the technology business. What is causing it – why does it take so long to get salespeople productive? Complex buying process: buying has gotten more complex, there are more people involved in complex B2B buying decisions and decision cycles have increased due to the difficulty of reaching consensus in a larger buying group. The length of the buying process is added to the initial learning curve. Salespeople don’t understand the market: Salespeople do not understand the market they are selling into, nor do they have a grasp of the macro and competitive pressures affecting buyers. Time taken to fully understand the market adds to ramp time. Hiring the wrong salespeople. Hiring mistakes and slow learners are a leading cause of death of small startups and they are hugely costly in established companies. Finding the right people for your company and rapidly inducting them is critical. Not enough leads: Selling is a profession learned by experience, from success and failure. The more customer/prospect face-time, the faster the salesperson learns and builds confidence. Weak marketing content and poor lead-generation practices put the onus on salespeople to generate their own leads and this is hugely inefficient. Weak value messages: Salespeople don’t have relevant conversational content they need to engage and create value across the buying cycle. Weak training: Complex products take time to learn and for salespeople to know capabilities, positioning and differentiation. Don’t understand customer buying process: Salespeople and marketers don’t understand how and why customers buy. Don’t have stories: Salespeople don’t have a “who I represent” (company story), “who Ive helped” & “who I am” story; “why meet” story, “why change” story, “why now” and “why me” stories. Dependence on pre-sales and SME’s: Because the product is technical, rookie salespeople are dependent on SME’s and pre-sales consultants to tell their story, which complicates and lengthens sales cycles and adds to cost of sales. Instead of qualifying non-buyers out in the early stages, new salespeople drag along techies and the sales call gets technical at the outset, which lengthens cycle time and increases risk of a no decision outcome. 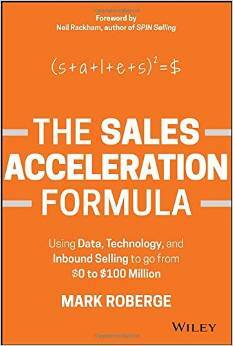 Mark Roberge, HubSpot’s Sales VP since inception, beautifully captures the problems in hiring and ramping salespeople in a new business in his recently published book, The Sales Acceleration Formula. “When you are scaling a sales-team, the to-do list is endless. Hiring, training, coaching, pipeline reviews, forecasting, enterprise deal support, leadership development and cross functional communication are all part of the day to day. Which fire to extinguish first? Not all salespeople or sales roles are created equal and finding the right hire depends on the maturity of your company and the marketplace. Is the salesperson selling into a highly transactional environment, or is it a disruptive startup selling complex products requiring a consultative sell? The first question is: – what do you sell, and who are your customers? A salesperson who’s great at high activity transactional selling might struggle selling a more complex product in a consultative setting. If you want to consistently hire reps that will turn out to become top performers, you’ve got to understand your own business and tailor your hiring process to match. At HubSpot, Mark Roberge started with a hypothesis and quickly established these 5 personal traits as the most important in hiring highly successful Hubspot salespeople. Get Mark Roberge’s book and you can adapt Mark’s HubSpot hiring success methodology for your business. 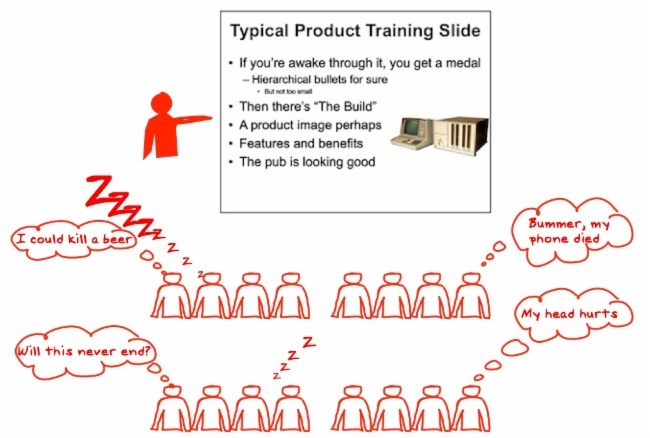 Adopt 21st Century Learning – Get salespeople to DO product training. We live in a world of constant change in the buyer’s realm, exacerbated by changes in the competitive landscape and a rapidly evolving selling tool-set. Rookies in their first sales role and career salespeople who wish to remain relevant and valued contributors to their business, must commit to becoming life-long learners. Arc of life learning comprises a new way of thinking about learning that keeps us learning, growing and exploring through our careers. Play, questioning and imagination are at the core ofarc of life learning. The old way of inducting salespeople through a boot-camp process that subjects new hires to massive PowerPoint bombardment from product managers must evolve to a new learning culture based on games, play, imagination and interplay between peers. “You have to decide what you are going to focus on, especially at your Boot Camps. New hires can’t and won’t remember everything your company sells, especially if it’s complex. Sales Enablement needs to identify which products and solutions new sellers will successfully sell, and which constitute the largest portion of the company’s revenue for inclusion in boot-camp. Broad-based slide presentations from product marketing on every product group will increase ramp time. Instead sales training must focus on the products or solutions that salespeople MUST know how to sell when they leave the session. This freed up time in our Boot Camp for daily interactive activities, where sales people are required to learn key messages and then present them, without using slides. One of the most successful initiatives in our boot-camp was our use of whiteboards and visual storytelling to ensure that all sales reps internalized the company messages. Salespeople learned two solution whiteboards and delivered them in teams during their first week. Having seen, heard, drawn and delivered each whiteboard story up to ten times, they left the class able to articulate our value proposition for our two most important solutions. We held a competition, judged by Sales Leaders at the end of the boot-camp. The culture around this activity was so strong that participants practiced until late at night in order to perform well. Using whiteboards and visual storytelling we were able to reduce sales ramp time to 9 months. Stay tuned for Part 2 of this article.